As I sit writing this post, the sun is going down, the heaters are on and all I seem to desire is a big warm jumper, a cup of hot green tea and some good TV. Depressing and sad but oh so comforting, say hello to Autumn! Summer days are fading away and Autumn gusts are brimming in (boohoo), it's now time to re-think that wardrobe. The UK (for those who have not visited before) gets pretty chilly at rapid speed, hot pants are friends we only get to see once in a while whilst coats and cosy jumpers are our lifelong best friends we heavily rely on. A new season means new stock when it comes to the fashion retail world and at times it can be pretty overwhelming when faced with rails and mountains of woven wool. 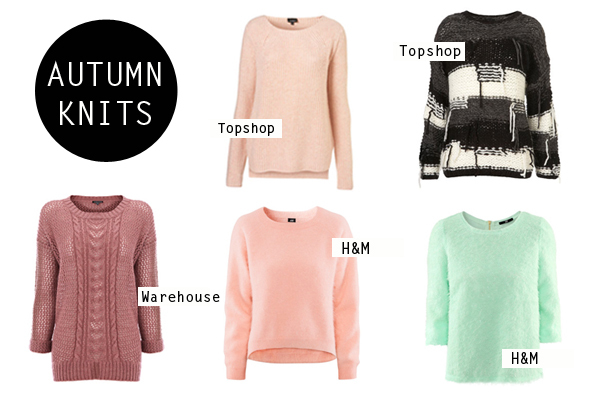 Here, I have picked out my top picks for these early Autumn days. Not fully letting go of the summer days, I have chosen some pastel knits, to brighten a dull day and dark shaggy textures to keep you feeling cosy and warm. Beautiful autumns knits.I love your collection so much.You have shared an amazing post.